Today i will tell all about my first challenge since i started working with leather. A few years ago, a friend of mine called me and told me that he bought something great for him and he needed me to help him with something. He made me curious, of course, and i accepted to meet him ans see what is all about. He then showed me his new acquisition. A Colt45 Peacemaker. A great gun. I loved it when i saw it. 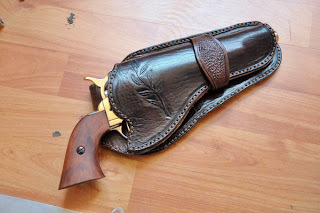 When he saw how enthusiast i was about that gun, my friend asked me if i would be able to make him a holster. Something unique. Well, how can i put it? I was thrilled. The next day i started working on a project for the gun. I had some ideas but i wanted to be perfect. So i studied a little bit on the internet, and then i started working. Here you will find a small tutorial about how i did it. If you have any question, don't hesitate to ask. I will answer you as soon as possible. First of all i catted the shape i wanted for the holster. I sculpted a small detail on the upper side of leather. I did a lot of measurement during the process. I hope you like what came out of my project. I looks great and my friend is showing my work to all his friends. Have a great day and if you have a project and you need some help, just write it down and send it to me via e-mail or post it on my blog, and i will be glad to help you in any way i can.